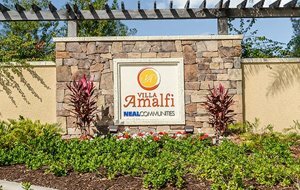 Villa Amalfi is a gated neighborhood that Neal Communities started developing in 2015. It sits on an 18-acre site on the southwest corner of Saunders Road (63rd Avenue East) and Lockwood Ridge Road. The community has its main entrance gate on Positano Court off Lockwood Ridge and has a peculiarity: Villa Amalfi has a Sarasota mailing address but it falls under Manatee County which provides services and collect taxes from this neighborhood and its residents. This oddity of sorts is fairly common amongst Sarasota homes for sale near the Manatee–Sarasota boundary line. A former pasture land, the Villa Amalfi site was platted with a total of 92 home sites. These lots are adjacent to the well-established community of Cascades at Sarasota to the west and to the Sarasota homes for sale in its sister Neal development, Woodbrook, across east on Lockwood Ridge Road. Though Villa Amalfi is relatively small compared with its immediate neighbors, it counts as one of the fastest selling developments which Neal Communities launched following the housing recovery from the Great Recession. Its theme of vacation-style living helped propel this recent property development as a leading pick among would-be buyers of Sarasota homes for sale. Neal meticulously developed Villa Amalfi as a maintenance-included community with its residences exclusively composed of charming paired villas built around just two main roads and a cul-de-sac. The community’s acreage likewise features an eight-acre pond which provides a serene backdrop for many of Villa Amalfi homes for sale. This pond also serves as a community buffer from the Lockwood Ridge-Saunders-Honore Avenue intersection on Amalfi’s northern edge. Besides this pond attraction, the community also offers to its residents some enticing amenities including a swimming pool, spa and cabana. Villa Amalfi homes for sale occupy 36-foot-wide lots on which Neal provides choices on three delightful home designs with Tuscan architectural features. Open floor plans along with spacious kitchens and covered lanais are the elements common to these outstanding villas. One of the Amalfi home models, the 1,434-square-foot Crystal Sand, was adjudged Best Overall in its multifamily home category during the 2017 Manatee Sarasota Parade of Homes. This one-story villa, also cited for Best Curb Appeal, Best Kitchen, and Best Masterpiece in the annual showcase, has two bedrooms, two baths, and a two-car garage. Expect a starting asking price in the high $200s for this award-winning home design. The quoted prices for the larger choices of Villa Amalfi homes for sale, Tidewater and Tidewater B, typically start from the $200s too which could level up to the $300s for builds with water views. The Tidewater options are designed with floor areas of 1,524 square feet and also with two bedrooms, two baths, and a two-car garage. Proximity to many commercial hubs, schools, and other points of interest in Sarasota, Lakewood Ranch, and Bradenton further sharpen the market appeal of Villa Amalfi homes for sale. A short distance up north, for instance, are the shops and restaurants at the Lockwood Commons which is anchored on a Publix Supermarket. The retail chain Walmart, ALDI and Wawa are also recent locators in this area of Lockwood Ridge Road and State Road 70. Below are the current real estate listings available at Villa Amalfi.